Episode #22 – Star Wars is Everywhere. Snoke is Everyone. We’re back from winter break. It’s a new day. A new era for Star Wars. Let’s ring it in like we rang in the New Year! That’s right, folks. 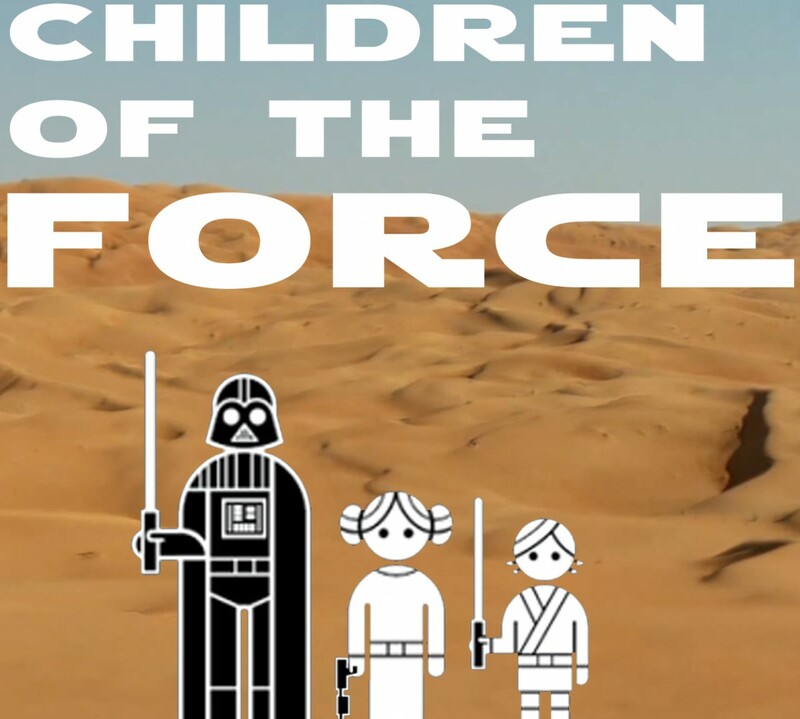 It’s an almost-regular episode of Children of the Force, a mere three weeks after the release of The Force Awakens. How, you ask, were we able to gather our thoughts and contain ourselves? Maybe I’ve been mentally preparing for this episode for a long time. Maybe it’s a Midwestern thing. At any rate, like an old friend, we’re here, we’re eating your food, and we want you to listen to what we have to say for an hour without any interruptions. Business as usual. Except for that new segment at the end of the show. That’s new. The kids talk about Star Wars gifts they gave and received for Christmas and spending a Star Wars Christmas with my parents, siblings, in-laws and all the nieces and nephews. Here’s that awesome shirt Anna got in her stocking. The bulk of my parents’ kids and grandkids went to a day-after-Christmas viewing of The Force Awakens. We’ve been reading Percy Jackson, which caused me to wonder if Snoke is analogous to a Titan of Greek mythology. Maybe? Probably not? The Force Awakens is making a lot of money. People like it. Rebels is coming. Not sure when, but I saw this from Making Star Wars a few days after the recording of this episode. For this first post-TFA Canon News segment, we talk about the state of the Star Wars galaxy before and during the events of The Force Awakens. Canon News is where the bulk of the podcast is going to reside for at least the next few episodes. There is just so much to talk about; so many things about the Star Wars galaxy that have been revealed, not only in The Force Awakens, but in the novelization, visual guide and other books. Bonus Canon News: Chewbacca did not spend all of the 30ish years between VI and VII with Han. He went back to Kashyyyk to chill with the extended family for a decent chunk of that time. What did Qui-Gon’s Force ghost say to Obi-Wan’s Force ghost when that horrible thing happened in The Force Awakens? We have a couple great guest questions on this episode. Torpedo Ted (@TorpedoTed13 on Twitter) asks if we’re going to see Boba Fett in the sequel trilogy. Mark Leonard of the Ictus Marketing podcast asks what we feel is the best viewing order for Episodes I-VI. Our opinions aren’t too ground-breaking (no Hatchet Method over here), but they do depend on what the viewer already knows about Star Wars. Finally, we have a round of opinion on Rey’s parentage. Both Anna and Liam are floored (in the best way possible) by how many people are talking about Star Wars. Liam’s classmates are spoiling the heck out of The Force Awakens. He tries to stop them. Anna’s friends are coming around to Star Wars which, in turn, is helping her to embrace the fact that she’s a Star Wars geek. The kids wanted to try to stump me on the show, so here’s the inaugural “Stump the Lump” segment where the kids quiz me. Star Wars 7×7 has been doing it forever and Who Shot First is a whole show built around a Star Wars quiz, so we make no claims to originality, here. But it’s something fun for the kids to do, which is pretty much the only criterion that needs to be met for something to make it on this show. The stumper for the day is: What is the name of the weapon wielded by the Stormtrooper who fights a lightsaber-wielding Finn on Takodana? Here’s a bonus photo of random awesomeness that the kids’ cousins created on Christmas morning.